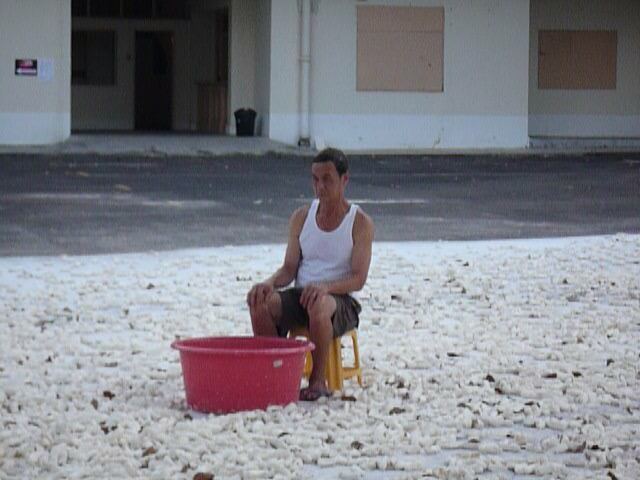 An elderly man seated on a stool facing a bucket of water under a tree flooded by 12000 soap bars, has roused much attention from onlookers to stop and spare a few minutes to observe what this performance is about. Some continue to look on and take pictures out of amusement or curiosity. The expressionless face of the man and his still posture, undisturbed for minutes to almost an hour, is definitely perturbing. Those who noticed this stillness might be left pondering for the message that this art installation seeks to communicate, with the expressionless face and motionless state of an elderly man, surrounded by 12000 bars of soap – all under a tree. Motionless as the man might seem to be for what can seem like several minutes to almost 30 minutes – that takes on your patience. But hang on if you are about to leave. Elderly man bending down to rinse a towel. Unnoticed (at random times), he bends over the bucket in front of him to pick up and rinse a towel to cleanse himself. Instantly after this series of motions, he is back to his expressionless and motionless state. This whole cycle could randomly reoccur in repeated motions. What does this tell you? Or you might even reflect on how this action relates to some part of your life that has been recurring everyday, even causing you to develop apathy from repeating the same series of motions daily. As I reflect longer on the elements of the installation with a still performance, I not only realize how much it really relates to certain stages of a person’s life, but also find myself discovering the philosophical inspiration of the artworks created by Paulo W. Tamburella, the artist who orchestrated this performance-based art installation known as ‘Fei Zhao’ (soap in Chinese). Despite the fact that his participation in Singapore Biennale 2008 is only his first stint in Singapore, where he is staying for barely a month, Paolo has reflected his remarkable grasp of the hectic, activity-driven Singaporean lifestyle, through his ‘soap’ performance-based installation as well as his natural ability to inspire enthusiasm and team spirit amongst his art assistants. On a nice Saturday evening having coffee at The Coffee Connoisseur (TCC) back in September 2008, I interviewed Paolo with an attempt to decipher the story from his ‘Soap’ installation. According to him, the installation seeks to ponder on the effects of consumerism over nature, involving a human role being caught up by the cares of the world that encompass materialism, daily consumption of available resources and random repeated actions that transcend youth and time. Cindy: How did you start your arts career? Paolo: I started by chance with no formal education from an arts school, I was in London and find myself living in a place with many artists and so I started to work in the arts. I also created crafts or art installations out of fun when I was a kid. Then I was invited to do a show in 1994 and then this becomes my job. Cindy: What is your specialty area? Paolo: Art installation, performance and sculpture but I work also with video. I like to work with different media. I believe more in ideas and process than in having a speciality. Cindy: How did you participate in Singapore Biennale, and were you inspired to come here? Paolo: I was invited to exhibit my work here. And since arriving here to work on my installation, I have felt very well here. The work that I’ll realize will be a performance based installation featuring an elderly man sitting under the tree inside the yard, surrounded by a flow of soap bars that would be joined and shaped together. Cindy: Why do you choose soap as the medium to work with to complete your installation. What impact does it have on your installation, or what role can it play in your installation? Paolo: Soap is a very common material that many people in the world consume in their lives, and it is symbolic of the mundane human actions that are recurring. In order to create a stronger expression of the human actions (accumulated in time), I try to use as many soap bars as possible to surround the man and the tree. This installation seeks to reflect on the cause, process and effect of Consumerism that involves our daily activities and their residue. While the role of every soar bar is to represent the moments of life, it also symbolises the traces of what we left behind from our actions. Cindy: What important role would the tree play in your installation? What are the important elements of your installation that communicate your idea? Paolo: As the focus is on the relationship between human actions and nature – so the important elements are the tree, the man and the soap. Representing nature, the tree is a strong element, and even visually, a beautiful element. Inactivity is also an important part of the equation – the expressionless face and motionless posture reflects inactivity. Inactivity could probably be a time of reflection for some who will question what are they doing with their actions, for instance, is washing a simple process even if it is an ordinary action? What do we consume in the process of doing something? And what should we achieve from our actions? And how much attention we give to our actions? And how many times do you do things that you don’t even realise? My installation also relates to humans making things that leave traces (represented by pieces of soap) behind. Cindy: Among your many interesting projects, they tend to reflect on you as a well-informed, philosophical, enthusiastic explorer of various exotic cultures other than your own, particularly reflected by one of your art projects called ‘The Football Hunters’ that was realized in India in 2006.
that project was a big patchwork made of 400 soccer balls opened and stitched together and I also filmed a documentary called ‘The Football Hunters’. ‘Fei Zhao’ for instance, tends to relate more to a very activity driven society in Singapore, with the strong emphasis to deliver or achieve something, and on getting social acceptance. To add to the relevance, a local man is chosen to play the role of the elderly man. The idea is to create something controversial that questions if we let things consume us, or if we consume the things. For people in their activity-driven lives, can they find the moment of inactivity to reflect on their actions if they have consumed something, or if their actions (or moments of life) have consumed them? Or do they give attention to what they consume or what consumes them? Cindy: Why do you pick an elderly man instead of a young man to play the role? Paolo: The elderly man symbolizes time and how time is witnessed by the traces we leave behind, such as soap bars.